Don’t expect monitoring to be perfect. There’s a bit of lag time between the camera and your smartphone — as much as a few seconds. To judge the delay, put your hand in front of the camera’s lens and then take it away, and see how long it takes for the change to appear on your smartphone. One caveat: The app doesn’t work when the camera is underwater. You can still record — by tapping the app’s Shutter/Select button before submerging the camera — but you won’t be able to monitor the scene. 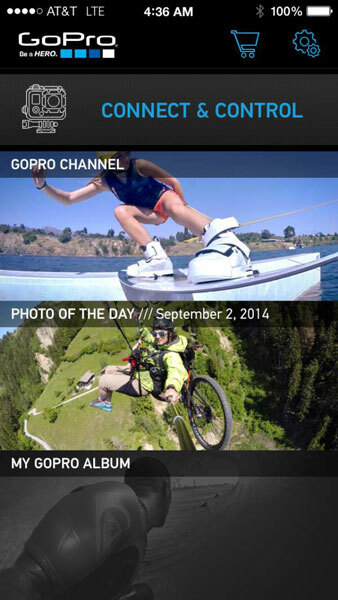 The GoPro App is a free download away. Just go to Apple’s App Store, the Windows Store, or Google Play. You can find more information at GoPro.com on the Software and App page. Open the GoPro App on your smartphone and then tap the Connect & Control button, shown here. Tap the Command & Control button. By default, the video icon should be selected, but if it’s not, tap the icon that looks like a movie camera.